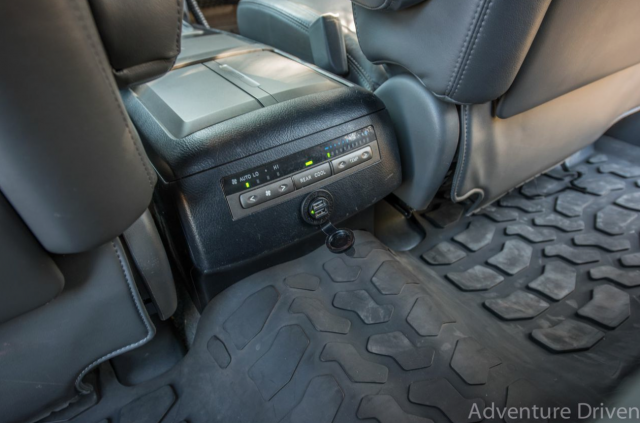 Despite being one of the lesser known and used of overland platforms, it is nonetheless one of the most capable and desirable vehicles available in the U.S. 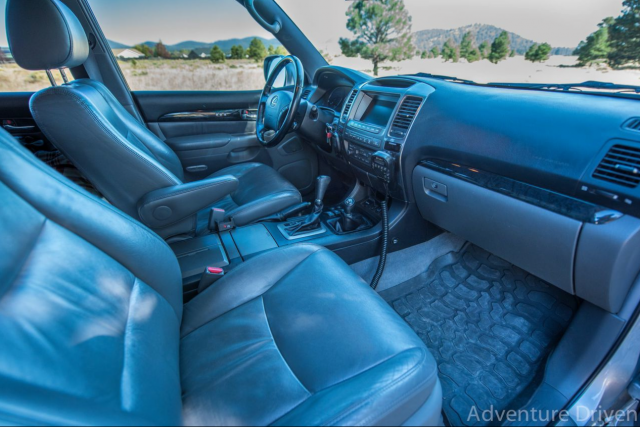 The Lexus GX 470 just as it sits in stock form, is quite something to behold. 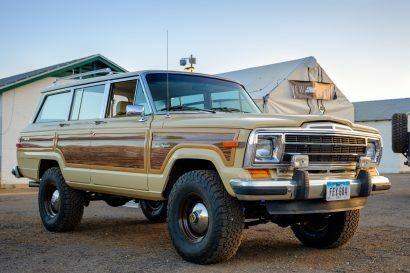 When given the full overland treatment, as is the case with Adventure Driven’s 470, it is something downright spectacular. 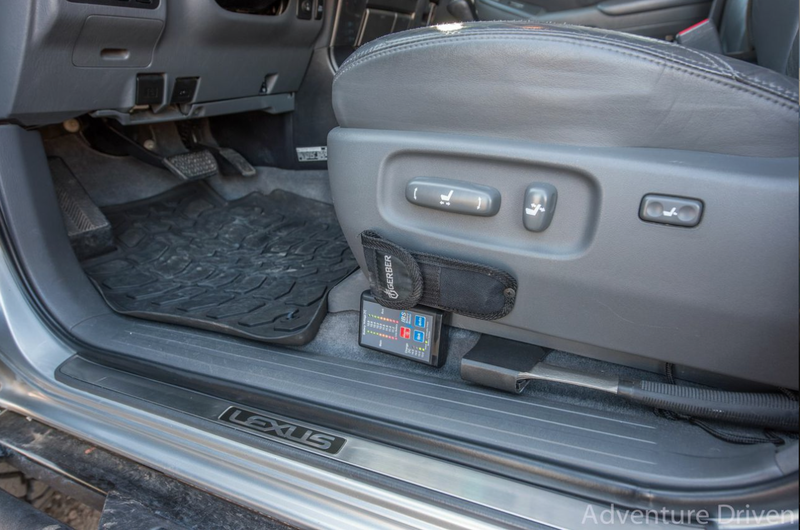 We take a closer look at their beautiful build and get a sneak peek at what it’s like to travel in a heavily modified GX 470. Our Considerations for choosing and building the 2007 Lexus GX 470 as our next overlanding rig. 1. 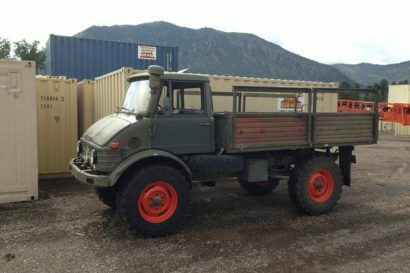 Must be reliable, a good daily driver and be able to withstand thousands of miles of extremely rough terrain, at least slightly luxurious for comfort, heated seats and factory navigation a plus. 2. Must comfortably carry four adults and gear for extended self-supported overlanding adventures. 3. Somewhat small for tight trails. 4. Strong brakes, we know we will be loaded heavy. 5. Must have stock lockers or they must be available for installation. 6. 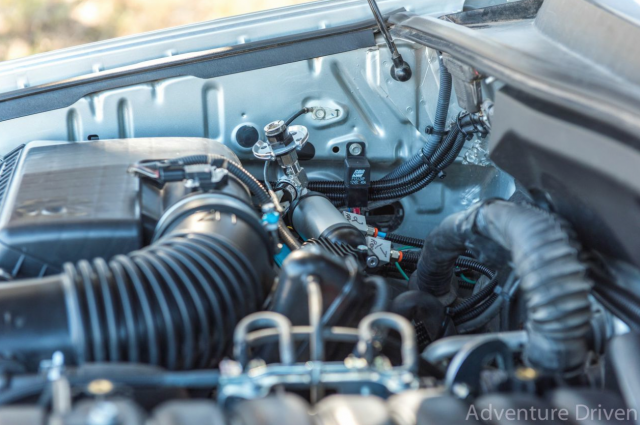 Must have a place to install a water tank underneath, space for a water pump, air compressor, and a second battery. Within easy reach of the driver, space must be viable for installing CB and HAM radios, buttons, trailer brake controller, other gauges and controllers, and extra charging and USB ports. Must also have room in the back for a fridge, and places to install secure anchor points, storage units and drawers. 7. Quality bolt on suspension must be available. We want to crawl over boulder fields, smoothly and quietly do many miles of washboard roads, take big hits, or even get the occasional air time and still ride like a dream on pavement. We wanted something as comfortable as a flying couch. As people who love to ride dirt bikes, sport bikes and horses we expect a lot out of our overlanding rig. We enjoy leisurely taking in the sights but, we occasionally want to go fast, catch air, and adrenaline yet, want to do it safely and comfortably. 8. After much deliberation, the Lexus GX 470 with KDSS was chosen. We found a cherry one in Phoenix, traded our lowered BMW sports sedan, (that we have overlanded in, it couldn’t go far off road but it was still a fun two weeks of camping adventures) for it and drove home. 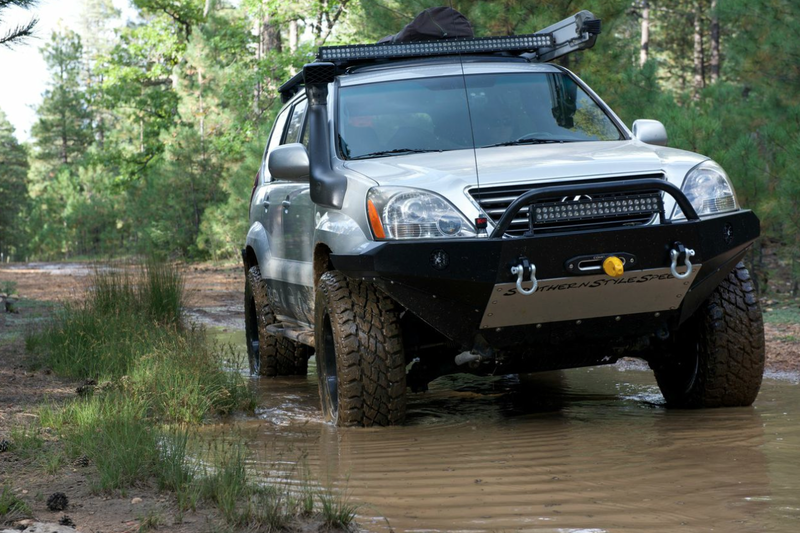 Already falling in love, we named the GX Lexy on the way back. 9. 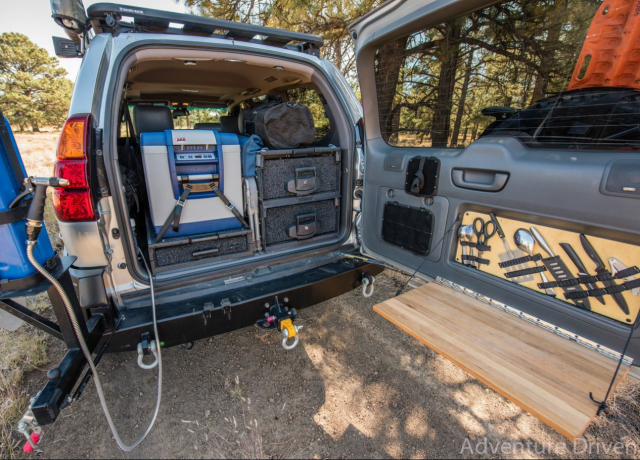 Devise a plan, overcome obstacles, and do what has not been done before to morph this luxury SUV into a comfortable, capable, reliable, high-flying, rock crawling, people carrying, overlanding rig. 10. After the must factors were known, and the vehicle chosen we decided on a list of other needs and wants. We want to live out of this vehicle for months at a time. We especially wanted a hot water shower, a foodie’s kitchen, and a rooftop tent. The tent because, we are like the “Princess and the Pea” when it comes to uneven sleeping surfaces, due to all of our various bodily injuries from bike, horse, and sports accidents. An awning for shade and inclement weather protection. 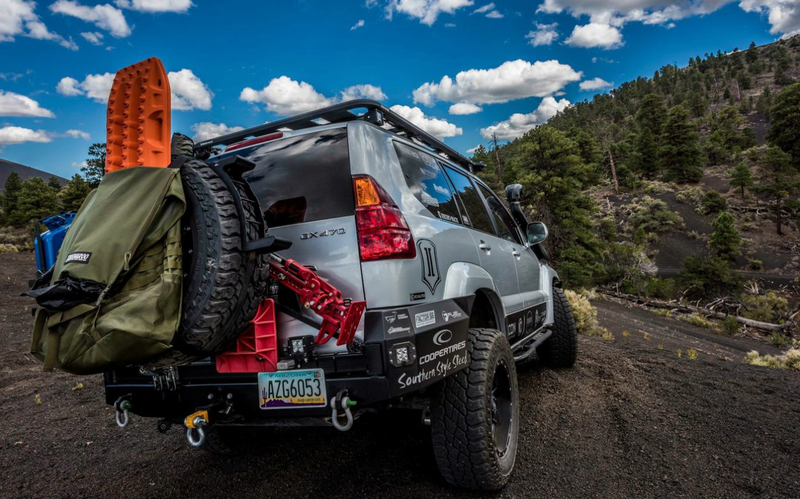 Other necessary items including a roof rack for the tent, front and rear bumpers, winch with synthetic rope, various recovery and get out of sticky situation equipment. 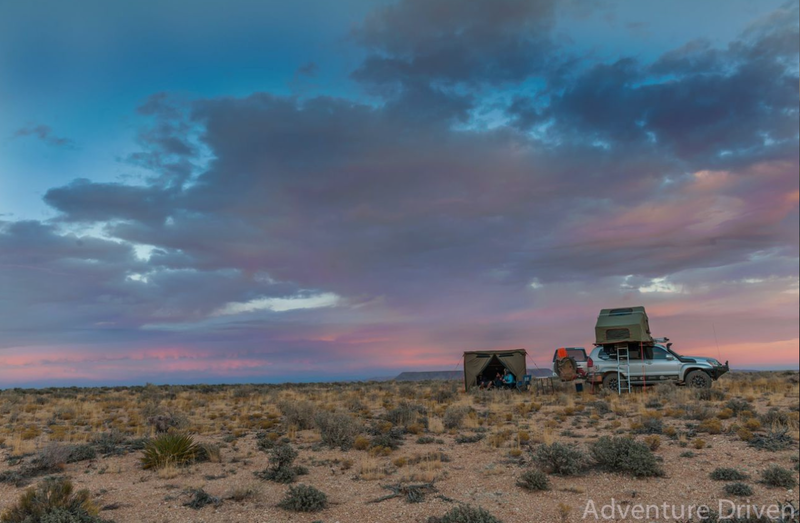 Also, rugged all-terrain tires, skid plates, rock sliders, space for extra gas, bright lights so we do not hit large animals or big holes and can find great camp spots at night. And, of course, a snorkel for cool, clean air, just in case the water gets deep, and because “It completes the look”. 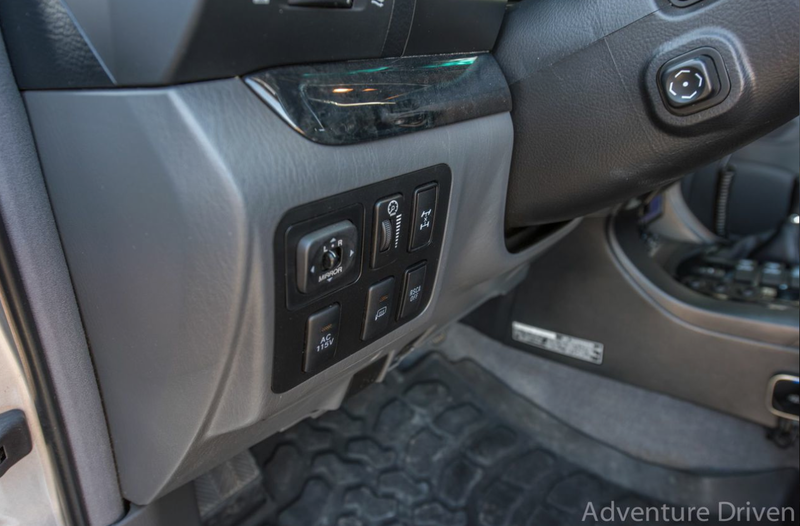 And last but not least, a twelve volt electric blanket outlet on the roof rack because we don’t stop when it gets cold. 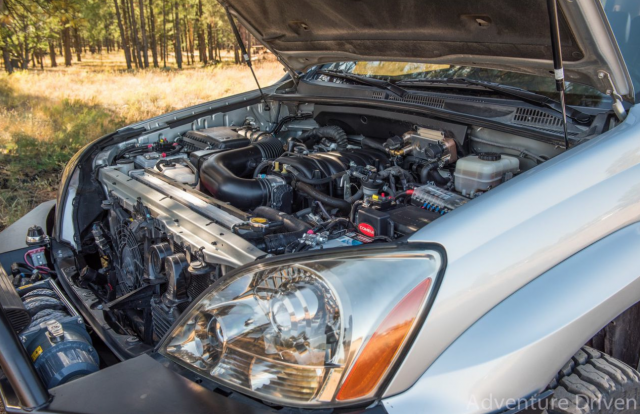 2007 Lexus GX470 Sport, silver, 4.7 V-8 all wheel drive, KDSS, Navigation, heated seats, automatic 109,000 miles. Synergy Manufacturing Hot water shower heat exchanger, hot water in the wilderness makes for unusually clean and very happy campers. 20 Gallon fresh water tank in the stock spare tire location on an RV 12v pump with an extendable metal hose. 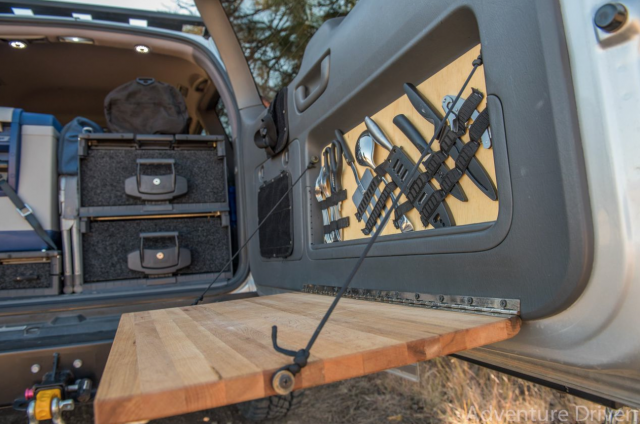 Three ARB Drawers, the top surfaces slide out. Custom fold down cutting board and utensils installed on the rear gate for easy food prep and fridge loading. Custom super special foodie’s dream spice box. Two Blue Sea power distribution blocks, one under the hood and one in the rear cargo area with 100 Amp circuit breakers. Overland Solar 95 Watt solar panel with quick connector. SunForce 30 amp solar panel controller. Extra front, middle and back dual USB ports. Trash-A-Roo, a great place outside the cab for our trash and other’s litter we find along the way. A shovel, hatchet and machete come in handy. 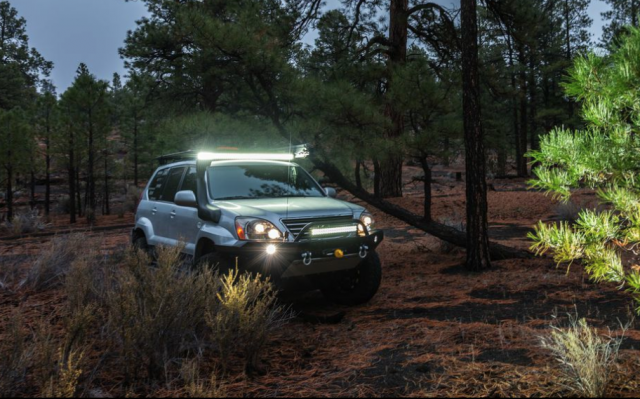 One 50” LED light bar, lights up the night so no elk, sasquatch or zombies can hide. One 20” LED Light Bar, this could be identified as overkill or back up, we choose back up. Two 4” LED front bumper lights angled to light the areas where we are turning. 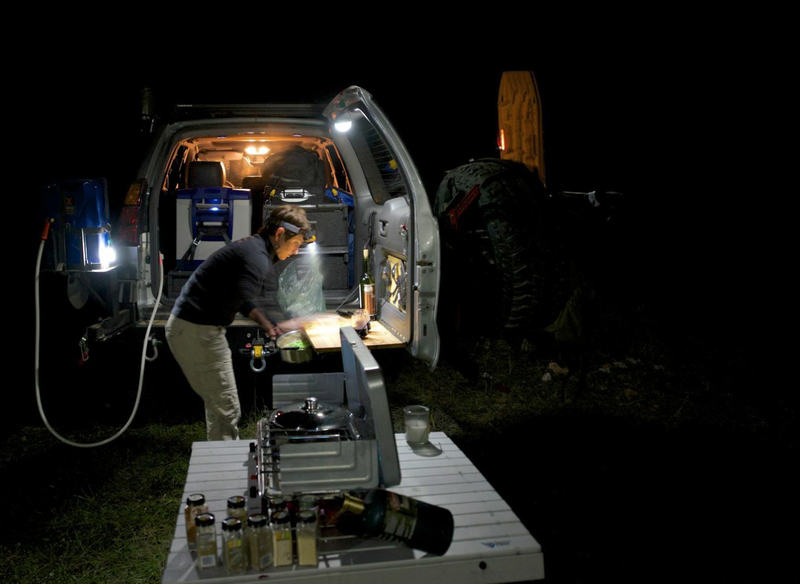 Eight Cyclone LED rock lights, no rogue boulders can sneak up on us out of the dark. 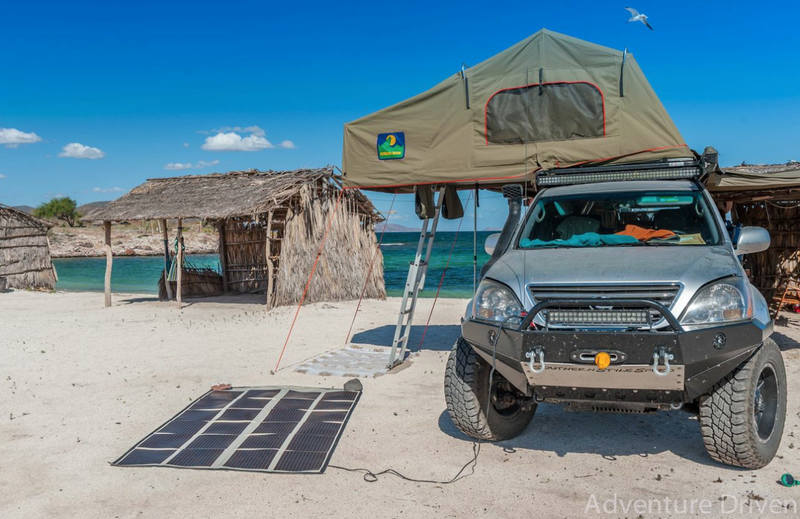 Four side facing LZR LED Cubes on the roof rack, great for finding the perfect camp spot at night. Three LZR LED Cube reverse lights. Two Cyclone LED’s in rear kitchen/cargo area, so there’s no mystery bugs in the food. ARB air lockers front and rear, we couldn’t do without them. Nitro 4:56 gears get us up and over the roughest terrain. High lift jack and base for sand. Maxtraxx, these things have a lot of uses. Budbuilt skid plates 4 piece kit. ICON Stage 6 suspension system with 2.5 remote reservoir shocks with CDC adjusters. ICON can smooth out the roughest terrain no matter the speed, we love it. Secondary front ICON shocks, yes, we want more air time. Two more extension walls for the awning. Now that winter is fast approaching we are excited to test the heater to see if it works as good as the air conditioner. 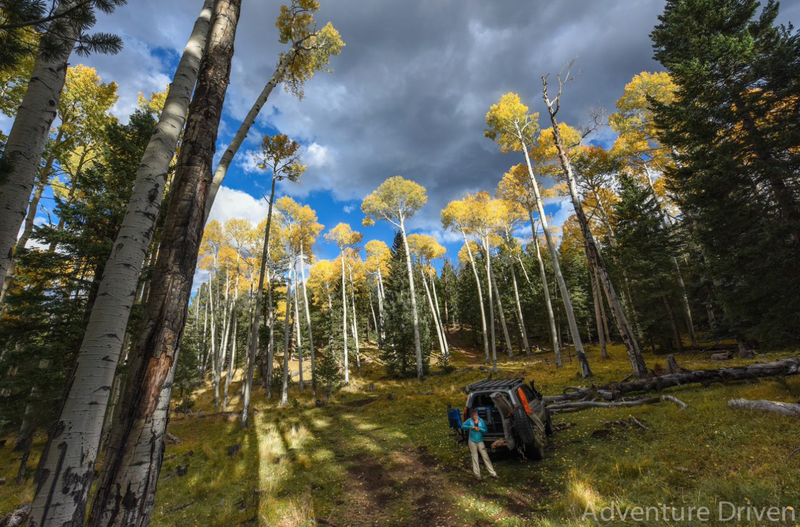 We always find a good reason to go out and find adventure. 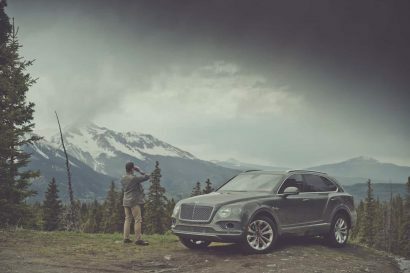 We encourage everyone, whether you use a purpose built vehicle or your family car, break free of the norm, live life beyond the couch, go find your adventure. Adventure Driven provides turn-key truck builds based on Lexus and Toyota platforms and also provides custom overland experiences to places like the Grand Canyon and Baja, Mexico. To learn more about Adventure Driven, visit their website [HERE]. 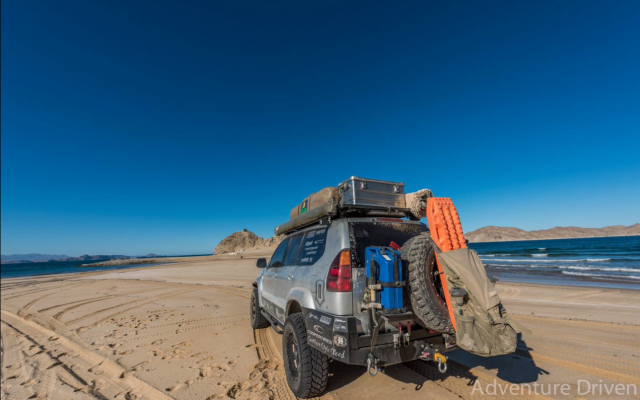 Landcruising Adventure: How do you determine the safety of a region?